Our algorithm works by first running through all the filters to see which investors have the settings that match the loan. Then it will check the total amount of all investors that are on auto-invest. However, the entire loan amount will not be open for auto-invest. 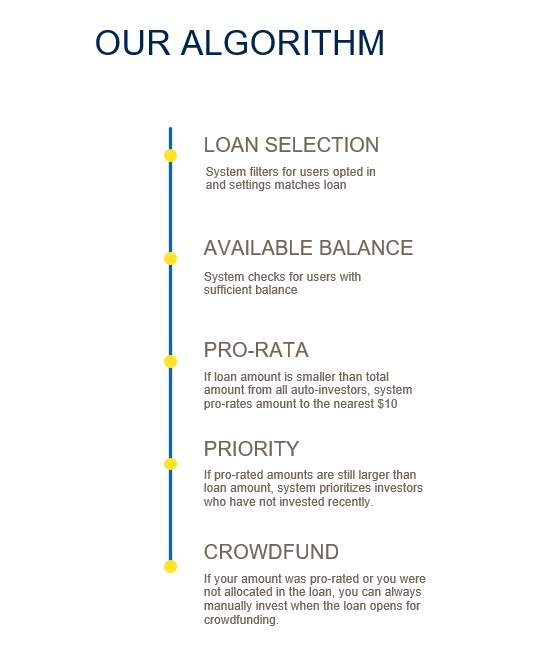 A percentage of the loan amount (between 20% to 40%) will be left open for crowdfunding. When your available balance is lower than the minimum auto investment amount you have specified, you can still be auto-invested if you have selected to exhaust your balance. However, to ensure that you can participate in as many loans as possible, do maintain a healthy available balance. E.g. of selecting to exhaust your balance: If you specified a minimum auto-investment amount of $1,000 but your available balance is $800, you will be able to exhaust your balance of $800 if your balance falls within the minimum and maximum investment limits of the loan. If the total auto-investments are more than the amount we are opening for auto-invest, the system will pro-rate it downwards to the nearest $10. However, the lowest the system will pro-rate your auto-investment amount to is the minimum amount you stated when selecting your range. E.g. If your maximum auto-investment amount is set at $1,000 but total auto-investments exceed the amount we are opening for auto-invest, the system begins to pro-rate downwards by intervals of $10, to allow as many investors to be auto-invested as possible. However, if your minimum auto-investment amount is set at $500, the lowest that pro-rating will reach is $500, and you will be auto-invested at least $500 into the loan. If there really are too many investors on auto-invest and the loan amount is not enough to accommodate all investors, the system will prioritise the investors who were not auto invested recently. This is to be fair to our investors, to give everyone an opportunity to invest however much they have deposited with us. However, not getting auto-invested into the loan does not mean you cannot invest. You can always participate when the loan is open for crowdfunding! Similarly, if you wish to top-up the amount that you were auto-invested, you can do so during the crowdfunding round! Click here to read more on a guide to auto-invest settings.